This week has been a roller coaster of emotions but it ended on a high with some good news from the endo at my annual check up and for that I am very, very grateful. I am so ready for the weekend. are you?! Before we get stuck in, can we just take a minute to appreciate the canine cuteness of today’s header! 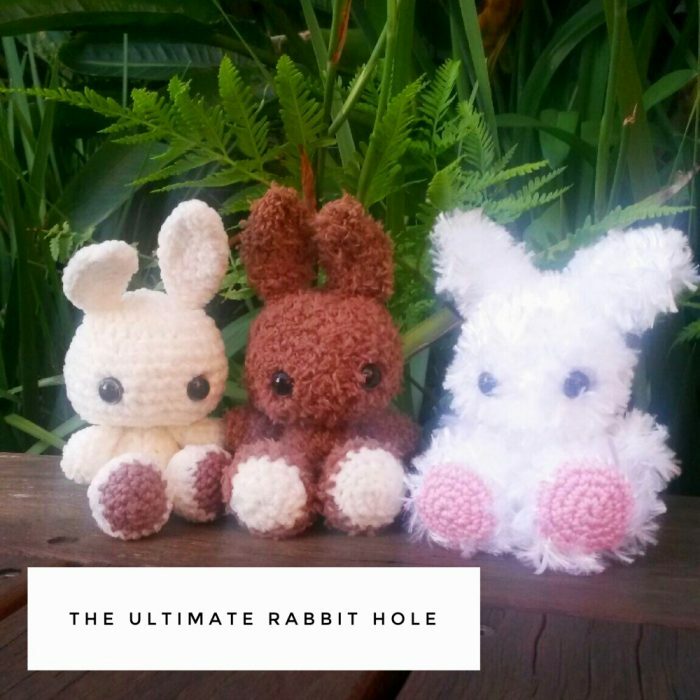 These bunnies were made by my talented friend, Agata, who I have renamed the Crochet Queen. I think the Rabbit Hole has a new mascot! I’m trying to persuade her to open an Etsy shop with her crocheted menagerie because everyone needs some of this crochet cuteness in their life, don’t you agree? This week there was so much goodness around the inter webs. This week’s sojourn down the rabbit hole is going to be action packed! Today is National Cake Day and quite frankly, it would be rude not to celebrate. I asked my trusty co-pilots, Karin and Paula about their all time favourite cake. Karin chose a butter cake with passionfruit icing, but I took things one step further in the passionfruit department, with Violet, the Passionfruit Sponge. Paula opted for an Eclair Cake. I hadn’t heard of it before but now I know about it, I have to try this delicious creation made with graham crackers, vanilla custard and chocolate frosting. So much nom! Mine is my nana’s best ever bread pudding which is a cake and a dessert all in one. I’ve been loving it since I was on solids. True story! We’ve dusted off our advent calendars, the cloth ones with pockets that we’ve had since we first got together. However, if I was in the market for new advents and I wanted to splash some cash, I’d be investing in one of these 14 awesome boozy advent calendars. These are obviously adults only which just goes to show, you’re never too old for an advent calendar! Now the gift guides are coming thick and fast around the interwebs and there have been some absolute crackers! If you’re looking for the perfect kris kringle gift, these beauty gifts will be just the ticket, and talking of tickets, check out the gift tags, they’re pun-derful! If you want something non-beauty for your buck, check out these kris kingle ideas with a gift for every budget and nothing over 25 bucks! If you love the planet as much as your friends and family, you’ll love these 24 low tox present ideas. Just as important as the presents you should buy, take heed of the ones you shouldn’t. This is a comprehensive list of the gifts you should not buy for other people’s kids, unless of course, you want to be on their frenemy list! When it comes to giving great gifts to small people, Tash from Gift Grapevine knows what’s what. Santa would surely give his santa-ly seal of approval to her latest gift guide for great gifts for 7-9 year olds. And if you’re giving to autistic kids this Christmas, be sure to read Kristy’s enlightening post and follow her one golden rule . I actually think the shopping is the easy part, it’s the wrapping that brings me undone! I think these 15+wrapping ideas will see me right! If you want to keep tabs on all your Christmas shopping, there’s an app for that. In fact, there’s a few, and this post has all the deets and everything else you need to know to keep track of and stay on top of your festive purchases. Talking of apps, Christmas can be as stressful as it is festive so here are 5 great apps to calm your farm. It’s not called the silly season for nothing, you know! If you fancy a festive love injection, you’ll want to check out these 7 Christmas date ideas. I’m planning to tick off a few of these! Forget decorating the halls with holly, how about decorating your sandals with pompoms?! Pom pom sandals are so in right now, and now you can make your own for a fraction of the price! Still on the subject of fashion, let’s talk canine couture! Check out these 15 dogs who go all out with their Christmas costumes. It doesn’t get much cuter than this! What’s your favourite cake? Are you on the pom pom shoe train? Can you wrap like a ninja or are you a crapper wrapper like me? What are your must-have apps?